By TOP SECRET, June 29, 2013 in Questions About Trout & Salmon Trolling? ok so a 40 class then. Would you use a dipsey diver style rod or downrigger? My preference over the two would be an 8.5 dipsy rod. The tip of most rigger rods is a bit too limber. Especially for anything over 300 feet. I actually have a medium weight 8.5 ft surf rod with plenty of guides, that works ok for the 600. An old Kunan downrigger rod I have works for the 300. Cheese ive never had a problem, but I put my otter pretty far out and make sure to let it out slow as well. It will be interesting to see what happens when you are using torpedo divers and try to deploy the rig over top of your dipsies with a otter boat. I've been hoping somebody would try this for me. Might work better with a TX44 so you could let it drop back behind the boat before engaging the reel? I'll second that. The idea of adding a torpedo diver to copper and trying to get it over my wire lines always sounded like a catastrophe waiting to happen. I never worked up the nerve to try it. Mudflat - I'm probably a wimp on this, but every time I get a copper hit I will reel in all the copper. Next, I pull the wire dipsy on the same side, then I redeploy the copper, and finally redeploy the wire. I always seem to have tangles when I'm trying to deploy anything over the top of my wires. Taking this extra step to pull out the wire and set the junk lines first - albeit a PITA - has avoided many a tangle and lost fishing time. I've never had a problem bringing copper over my dipsy's as long as I leave it out down the chute long enough that it stabilizes but I'm too wimpy to try it with a 300 cu and a torpedo. Let's let Nick do it first, he'll try anything! haha I definitely have a lot of practice untangling lines! I ordered 300ft of bloodrun copper from amazon, but now it's saying it won't be here for 2 weeks! Annoying, so for now I'll have to use some of the left over 100ft pieces of copper I have. Warrens didn't have any torpedo divers, so I'm hoping screwy louie's or someplace else has them. Not gonna lie, I'm definitely worried about letting out the copper with torpedo weight when I already have my dipsey out! I'm actually thinking it may need to go under the dipsey as opposed to over it. I remember you had once posted a tutorial on changing out the drag on a Tekota 500. Any chance yoy can post that again? When you give this a try make sure the GoPro is running so that we can all share in your pain. If we could meet up I would give you one of the torpedo divers I won at last years Salmon Slam ! Step by step for the tekota drag install- pretty straightforward. Nick- nice vid btw! It will help out the first timers immensely! It's also cool to see how other guys do it out there. DR it was fairly easy to do, the tuna tom website had been missing most of its photos when I did mine though. Here is the thread with step by step photos though. Here's another tutorial on the 500 LC from Alan Tani. I hope you don't mind my butting in. 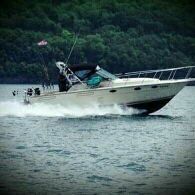 Roy, if you're around Thurs-Sun sometime near Sodus let me know, I'd love to buy one of the Torpedos off of you!